Just under four months from Election Day, Democrats and Republicans are feeling markedly different about the 2018 midterm elections. With the GOP in control of the White House and both chambers of Congress, most of the party’s voters are feeling confident (61 percent), proud (56 percent) and happy (52 percent), according to Morning Consult surveys of registered voters from each party. Democrats were far more likely to express emotions that reflect their time spent out of power. Most of them are worried (61 percent) or frustrated (58 percent) — and more importantly, some political scientists say, they’re significantly angrier than their GOP counterparts. That enthusiasm gap could prove decisive in the battle over control of Congress. “Anger is an emotion that is strongly correlated with participation” in elections, Vincent Hutchings, a University of Michigan political science professor, said in an interview this month. Hutchings co-authored a 2011 study that found that anger is more likely to lead to political participation than emotions such as anxiety or enthusiasm. The study pulled 24 years’ worth of data from the American National Election Studies, a randomized experiment of 411 people and a survey of 452 Americans who voted in 2008. “People tend to feel very differently about government and politics when their party is out of power, and so that might really influence some turnout in the midterms,” Masha Krupenkin, a political scientist and Ph.D. student at Stanford University who recently co-authored a study on negative sentiment and voter participation, said in an interview this month. That dynamic has been evident in some of the most pivotal midterm election cycles of the recent past, especially in the 2010 wave. Grassroots rage of the conservative tea party movement was on prominent display before the GOP picked up 63 House seats. In general, midterm election results tend to favor the party locked out of the White House: The president’s party has lost more House seats than it’s won in 18 of the past 20 midterm elections, surrendering around 30 seats in each race. Democrats will need to flip 23 seats in November to regain control of the chamber. “Humans tend to have this negativity bias that’s very well-documented in psychology that negative information drives our actions and motivations much more than positive information,” Krupenkin said. 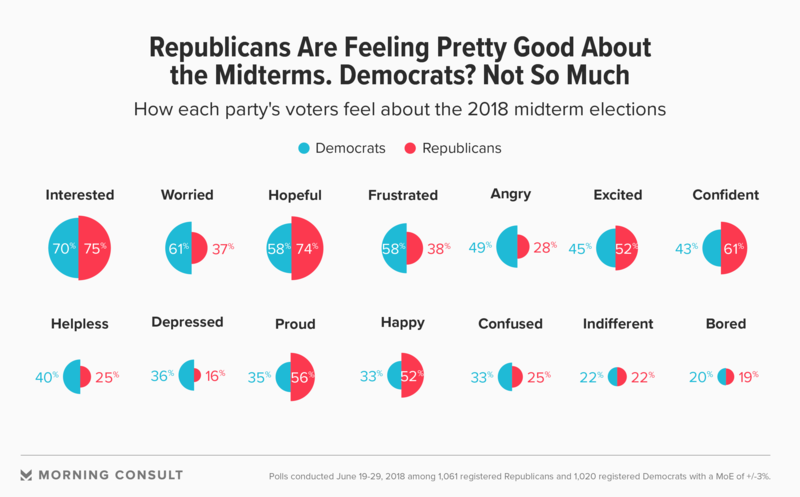 When asked to prioritize which emotion best described their feelings on the midterms, voters from both parties were more likely to pick a positive sentiment: 26 percent of Republicans and 23 percent of Democrats said they were mostly hopeful. The fury and prominence of the tea party has largely waned — just 4 percent of registered Republicans in the poll described themselves as tea partiers — but the anger among the Democratic base is producing some of the same type of intraparty friction that beset the GOP after former President Barack Obama’s election in 2008. The survey shows that in the past year, Democrats have grown more bearish about the direction of their party by a margin of 10 net percentage points: While 55 percent said the party was headed in the right direction, 28 percent said it had gotten off on the wrong track, versus 61 percent to 24 percent in the 2017 survey. Democratic leaders, like their Republican counterparts under Obama, could be under increased pressure to take a harder line against a president reviled by the base, deepening fissures within the party. That could make it more difficult for Senate Minority Leader Chuck Schumer (D-N.Y.) to lead a caucus split between liberals from safely blue states who have 2020 presidential aspirations and conservative Democrats in red states who are up for re-election this year. But from a political perspective, Krupenkin said, it’s worth the headache, as animosity toward President Donald Trump can mobilize those Democrats who had not been politically active.“We saw this with the Women’s March, as well as with other recent protests like March for Our Lives,” she said.